As the Westchester Town Center BID Ambassador, it’s Steve Rhodes job to know all the businesses in the Westchester business district, and there’s one that he knows particularly well: Soundsations. The music enthusiast says he stops in three to four times a month to check out the local record store’s inventory, which includes vinyl, DVDs, CDs and T-shirts. As the dad of two sons, Jaren, 17, and Jacob, 12, stopping into the shop with his kids has been a great way to share his passion for music and find new bands that they can all enjoy listening to. Steve loves Soundsations and thinks you will, too. Check out Soundsations for all your music needs at 8701 La Tijera Blvd. in Westchester. 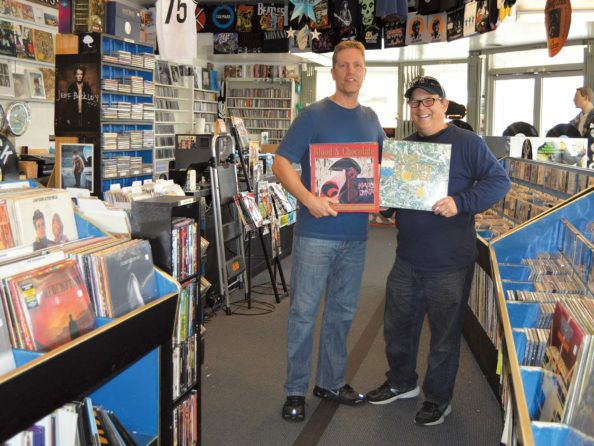 Pictured:Soundsations co-owner, Lee Wilson, and Steve Rhodes (right) show off some of their favorite albums. Does your favorite local business deserve a shout out? Send us an email at westchesterhometown@yahoo.com for a chance to share your favorite hometown spots with our readers.